I knew that one of my favorite writers, Marian Keyes, had a new novel coming out, so I was thrilled to be able to buy it a few weeks early on my recent trip to London (it had already been released in the UK). It was a good thing I decided to invest in the book, since long delays at the airport meant that I had plenty of time to get engrossed in the story. The Woman Who Stole My Life concerns Stella Sweeney, a Dublin-based woman who is the author of the recent book One Blink at a Time. Stella had suddenly developed Guillain-Barre Syndrome and spent months in the hospital recovering. She was unable to speak or move and could only communicate by blinking her eyes. Her neurologist, Dr. Mannix Taylor, takes the time to actually try to talk to her, working out the blinking code to ask questions. Stella is married to Ryan, but their marriage, after 18 years, has reached a somewhat boring plateau. Ryan has always dreamed of becoming an artist, but through a series of events has gotten into the custom bathroom remodeling business. He's very successful, but unfulfilled. Their two children are typical teenagers: Betsy is dreamy and laid-back, while Jeffrey is petulant and moody. Stella co-owns a salon with her more driven sister, Karen. When the illness strikes, everyone must try to get along without her. At the same time, there seems to be an undeniable spark between Stella and her neurologist . . .
Once she's back home and recovering from her illness, Stella is stunned to receive a box of books. It seems that while blinking out messages to Mannix, he was keeping a log of her thoughts and sayings. He's assembled them into a book and had it privately printed. Stella is touched and gives out the books to family and friends. When one of her books makes its way into the hands of a celebrity, suddenly agents and publishers are knocking at her door. Eventually, Stella splits fairly amicably with Ryan and, after a similarly civilized divorce between Mannix and his too-good-to-be-true wife Georgie, the former patient and her doctor begin a torrid relationship -- much to the disgust of Jeffrey. The publishers are so enthusiastic about the prospects for Stella's book that they insist she relocate to New York City to begin book tours and publicity work. Mannix quits his job and follows along, as do the children. Ryan is understandably miffed that his ex-wife is becoming world-famous when he is the "artist" in the family. During exhausting rounds of publicity, Stella is grateful for the help of her new best friend. Gilda Ashley bumps into Stella in a store, and immediately becomes her personal trainer, stylist, and confidant. But is Gilda really too good to be true? The book shifts back and forth in time, with present-day scenes letting us know that Stella is back in Ireland, broke, jobless, and without Mannix. So what happened to the glamorous NYC life? Those events fill out the story, as she struggles with her new-found fame, and the demands of trying to write a follow-up book. 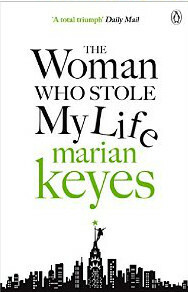 Marian Keyes's books have always been favorites of mine due to being laugh-out-loud funny, while at the same time dealing with difficult and sometimes tragic subjects. This book did have some funny moments, but overall, it was something of a let-down. Stella was so wish-washy, especially where loutish son Jeffrey was concerned, that it was hard to feel anything but exasperation for her. There were also some very strange elements to the story, such as when she and Mannix were faced with financial difficulties -- it apparently never dawned on either of them that he could just resume his medical career. I'm always thrilled to read a new book by this wonderful author, but I can only hope that in the next one she'll regain her comedic spark. She's already given each of the Walsh sisters her own book, but maybe she'll discover a long-lost Walsh cousin or something to take up the reigns of the next story!